English League One team Chesterfield have signed Bermudian Rai Simons, the club announced today [Apr 8]. The marks the first professional contract for the 19-year-old footballer, who plays for Bermuda internationally, and scored in Bermuda’s 2-2 draw with Grenada last month. 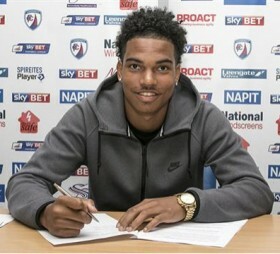 “Chesterfield have signed Bermuda international striker Rai Simons from non-league Ilkeston,” a statement from the club said. Congrats Rai so very proud of you !! Just wondering, what team(s) did he play for in Bermuda? Why the dislikes? I asked a question. The article said he moved to England when he was 15, therefore one would assume he played locally for some local youth team like Village, PHC, DandyTown, Colts, Boulevard or someone else. It is a valid question and the answer is not in the story, so WTF with the dislikes! All best wishes to Mr. Simons as he joins the Chesterfield team. We look forward to seeing you in action! Super cool! Well done – lots of hard work involved – so so so pleased it’s paid off! Congratulations! Be careful if someone gives you a brown paper bag though, they have history in Cheaterfield. Dislikes clearly have no knowledge of the history of English football, or the days when opposing fans would wave brown paper bags at the Chesterfield players to taunt them after it was found out that was how they were receiving illegal bonus payments. Well deserved, you worked for it.